Posted on Thursday, June 28th, 2018 at 5:25 pm. 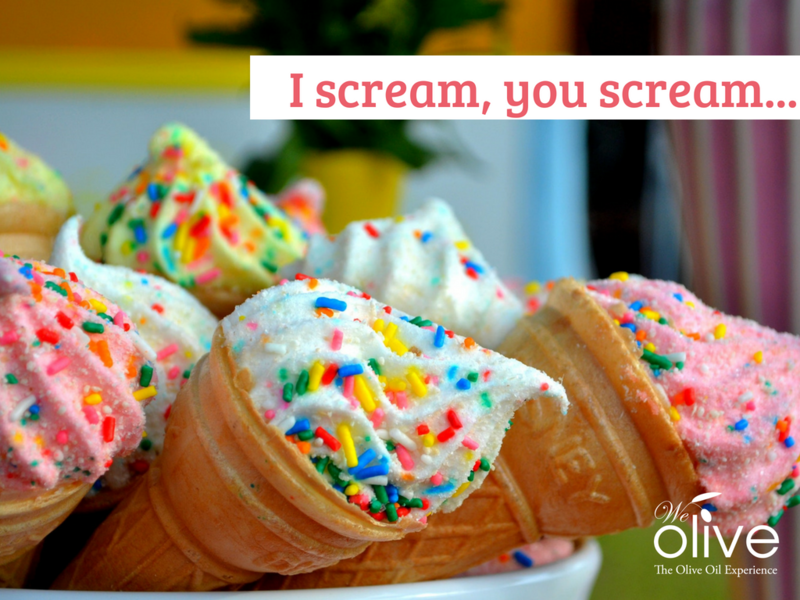 While olive oil and vinegar may not be the first thing you think of when it comes to ice cream toppings, they just might be your new favorite! Top-quality EVOO and balsamic vinegars and richness and complexity to basic chocolate and vanilla ice cream. Here are some of our favorite ways to use olive oil and vinegar as an ice cream topping. Whether you prefer a robust, grassy olive oil or a delicate, fruity EVOO, extra virgin olive oil is absolutely delicious on chocolate or vanilla ice cream. Drizzle liberally and then sprinkle with a coarse sea salt, such as Maldon, to really make the flavors pop. While we’d probably steer clear of Garlic Olive Oil on ice cream, Meyer Lemon is lovely on strawberry ice cream and Blood Orange Olive is delicious over chocolate ice cream. We’d also recommend trying Fresh Basil Olive Oil on peach ice cream! Our balsamic vinegars lean on the sweet and tangy side making them a delicious alternative to chocolate or caramel sauce. Our Aged Balsamic Vinegar is best over vanilla or chocolate ice cream with fresh strawberries. Try our Peach, Pineapple or Strawberry White Balsamic Vinegars on vanilla or fruit-based ice creams. Our dark balsamics include Blackberry, Fig, Blood Orange and Triple Chocolate and work equally well on vanilla or chocolate ice cream!